I heard from Bill this afternoon via e-mail. Here's his second day report. OK---day 2--bike goes on trailer, towed to Mitch's Motorcycles --ride over--end of story. After a little thought, I realized that trying to fix it myself under the circumstances was not a real good idea, so I called Tony the motorcycle towing guy. He was very helpful and friendly (and talkative!) 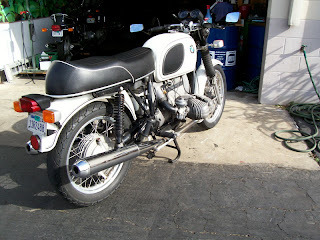 so I learned a lot about old bikes on the half-hour ride to Mitche's. Mitch is a great guy with tons of experience with the classic airhead boxer (see--I'm even learning a new language) and he is going to replace the steering head bearings, steering damper, clutch, all cables, tires, handlebars, ect... (its that "etc..." part that really rings the register!) which will make the old gal ride like new once more (and definitely a lot safer). We spent an hour and a half deciding what needed to be done, and setting priorities, while Mitch thoroughly enjoyed himself finding more things wrong that needed repair or replacement. The result was a work order (yikes!!) that caused enough pain to distract me from the other pain in my left hand, legs, etc. from that ride down PCH yesterday. Anyway, I'm glad it's in such good hands.  My Airhead in the ICU----- Mitch's shop in Torrance, California. So... the bike is all happy and taken care of but what about me--I suddenly realized I don't live here and don't have a bike to ride home. Now I just have to find a way back across the continent to Key West. Should be no problem for a seasoned traveller--right? But there are a few obstacles. First, its a holiday--every train, plane, and bus is booked solid for a week. Second, there is a massive blizzard in the mid-west that has closed Denver airport for 2 days, and I70 is closed too. Since I much prefer an Amtrak Train to a Continental Cattle Carrier, I'll forego my frequent flyer miles (and the $1075 ticket price) and go for the train. I take the Metro Blue Line to Union Station. All Superliner long-distance trains are booked for days. But...I know a trick. You wait till midnight when any unpaid reservations become available again and bingo--I buy a ticket to Ft. Lauderdale for less than half the CCC fare. So it's the Southwest Chief to Chicago, the Capitol Limited to Washington, and then Silver Star to Ft. Lauderdale arriving Wed. 12/27. I'm in for a great train ride through a winter wonderland. 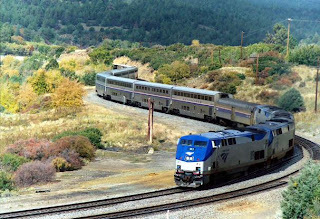  Amtrak's premier passenger train, the Southwest Chief, climbs the grades of Raton Pass, N.M., leaving Colorado. Whew! Took me a grueling hour to find that photo. I got lost in train sites. It happens. Enough for now--gotta go catch a train! enjoyed the comments from Bill Brice, especially his good words for AMTRAK and his plans to return on the great Southwest Limited (on the old Santa Fe) via Chicago. Were it any time other than Christmas Eve or Christmas, I would go greet him at Chicago Union Station, making him wonder how he could get a Key West greeting in the Windy City. Looking forward to getting back down to Paradise myself, and our house on Thomas Street - keep the neighborhood happy and festive until we get there. Best holiday wishes to you and Janet.